11" x 14" 2 ply strathmore. 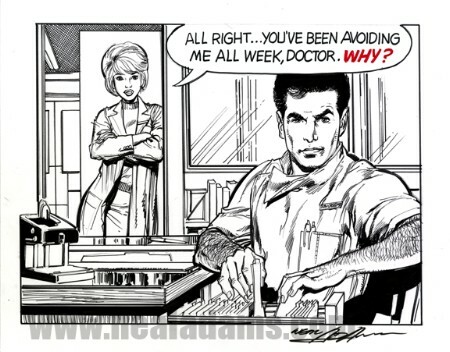 Neal built his drawing/inking chops while doing the comic strip Ben Casey at the beginning of his career. The style of inking he used is slightly different than his comic book work. Some would say much more photo realistic, while others can't help but be amazed at the inking style used. When an artist can't cover up with coloring he has to have a line quality to his work that modern comics just don't demand. While we don't have any of the original strips to sell you, we thought it would be fun to get Neal to make panels from the strips, using the intense inking style he did for the strip, in a cool frame worthy size. While some prefer the intense hero work he does, some may still appreciate the skill it takes to do work such as this. It is unmatched. PS: The Ben Casey book is being worked on now.